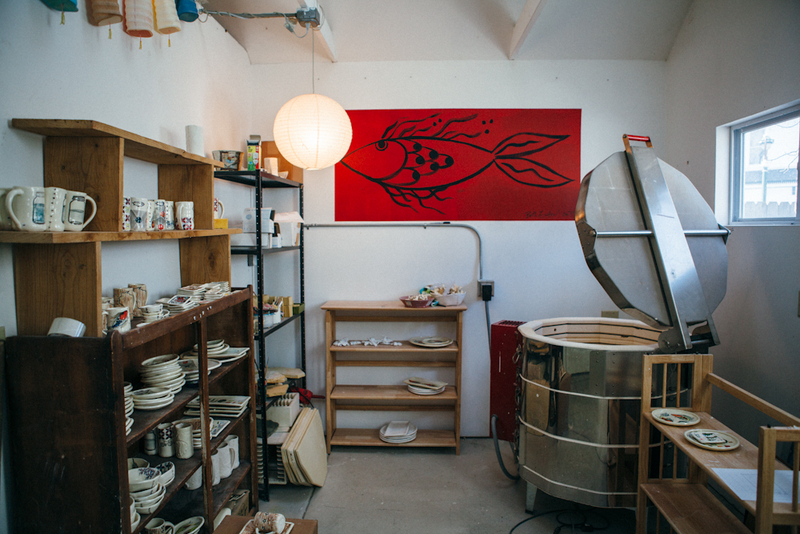 Visiting the Bay View studio of Beth Eaton Pottery, I had the enviable sense of the elements of work and family, business and creativity in harmonious balance. Beth Eaton’s work is featured in the Uncommon Folk: Traditions in American Art exhibition store, and is full of warmth and laughter and radiates a go-with-the-flow attitude as well as a clear vision. She is someone who both creates and responds to possibilities. An early example: When Beth and her husband bought their home in Milwaukee’s Bay View neighborhood, the property needed a garage. 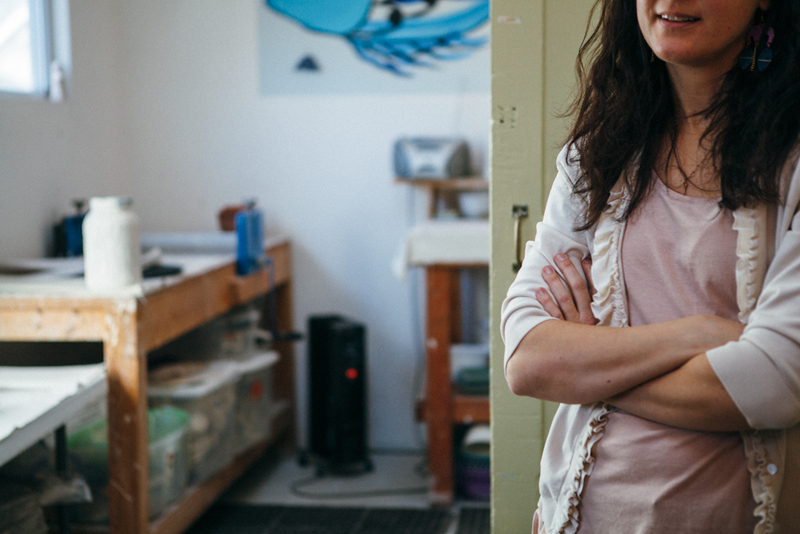 Even though their family was just starting out at the time, she thought, why not take the opportunity to create a studio space in this new structure, full of possibility? 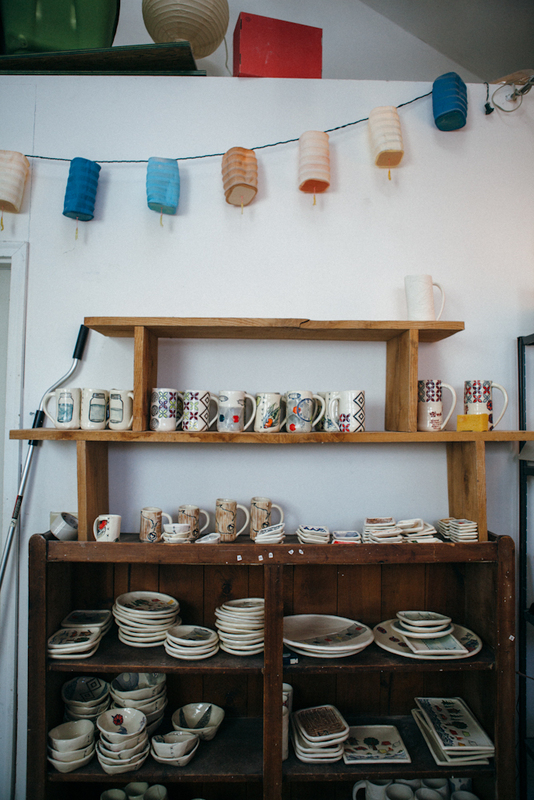 Although when her children were very young Beth had less time to dedicate to her craft, now that they are older (Hedy just celebrated her seventh birthday and Charlie is twelve), the space is now the base of operations for a growing professional pottery studio. 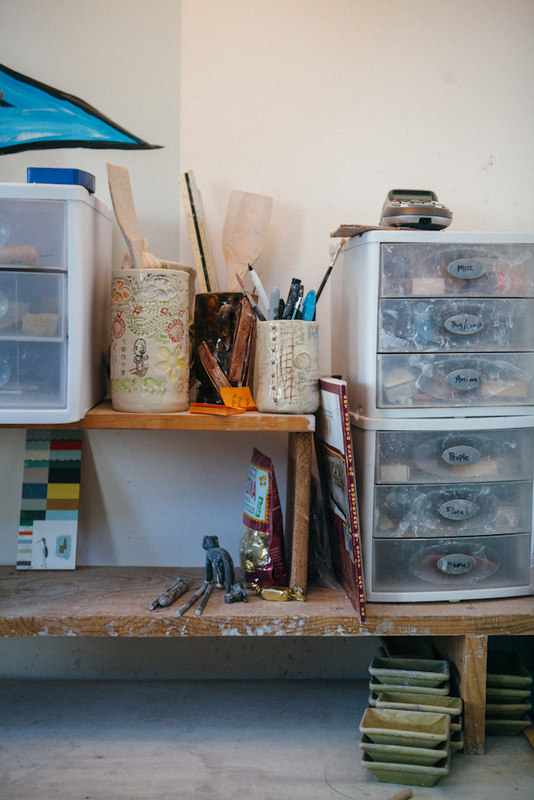 Read on to learn more about Beth and see pictures of her beautiful studio (and for a giveaway!). 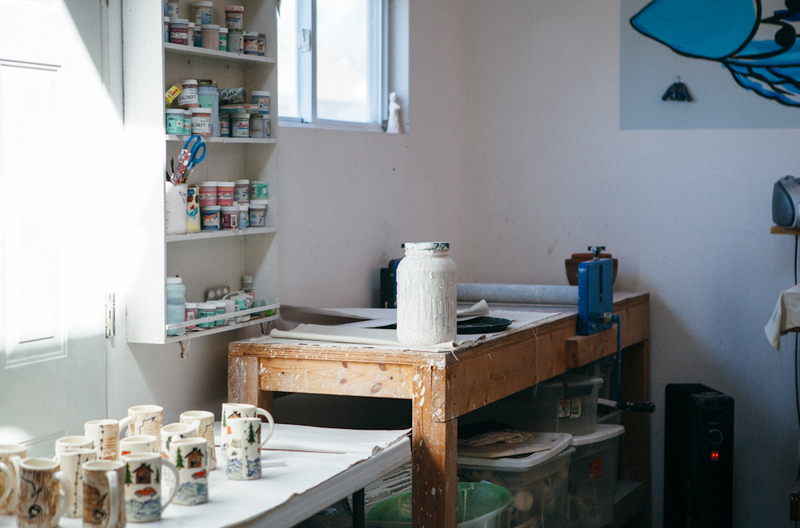 While her children are at school during the day, Beth shapes her clay pieces in the studio behind the house. Then, when the family is home together in the evenings, she brings the works inside to her dining table to paint—although now that the kids are older, she says, “It’s nice to know that I can run out, then come back to it, too” while the kids have friends over or are busy with other activities. On the Friday afternoon I visited with the photographer Megan Yanz (whose beautiful images accompany this post), Beth’s daughter Hedy joined us for the beginning of our interview before heading over to play at a neighbor’s. 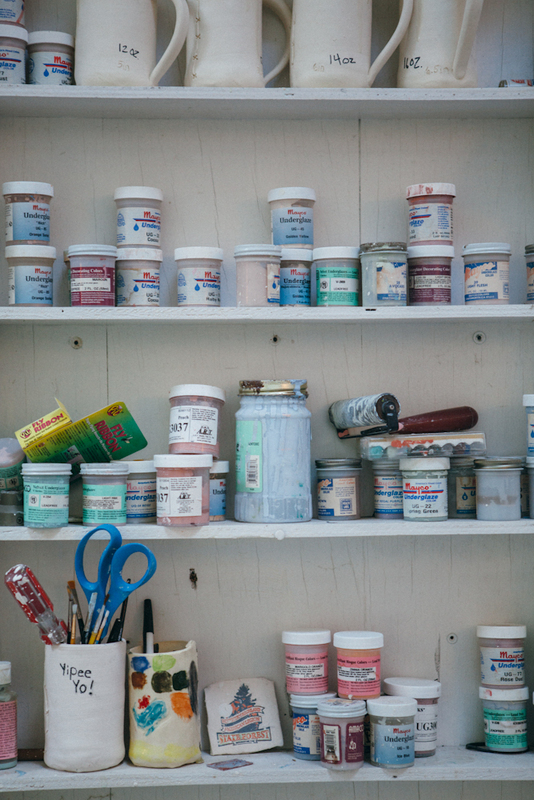 Hedy and her brother Charlie have been working with clay since they were very young–you can see some of their early works in the family’s pantry in the photo to the left. 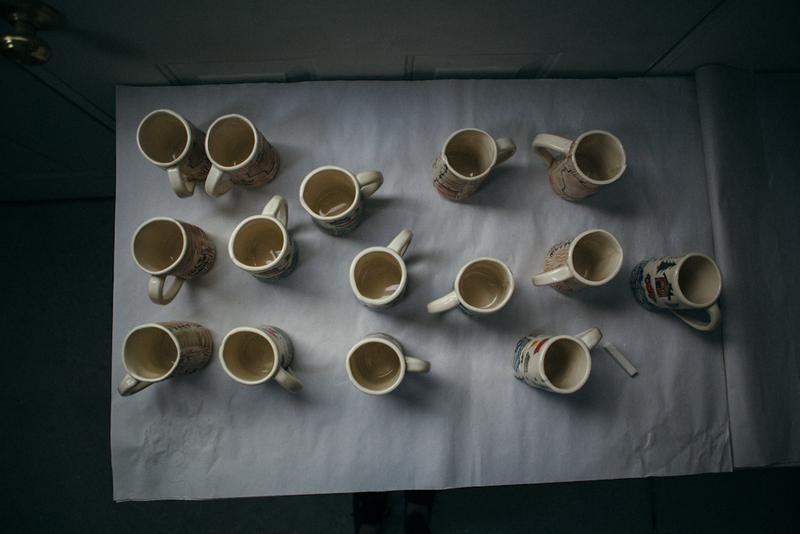 In fact, Beth’s family has hosted kids’ ceramics classes in their backyard throughout the summer for nearly all of Hedy’s life! Beth also teaches ceramics at her kids’ school and has participated in many of Milwaukee’s most popular art fairs, including Art vs. Craft and the Urban Garage sale at Turner Hall. You, too, can stop by her studio for a “Seconds Sale” during the South Shore Frolics the second weekend in July, or say hi to Beth at the Fernwood Montessori School’s Art Fair on May 5th. See Beth’s work in the Art Museum’s exhibition store when you visit Uncommon Folk: Traditions in American Art through May 4, 2014. 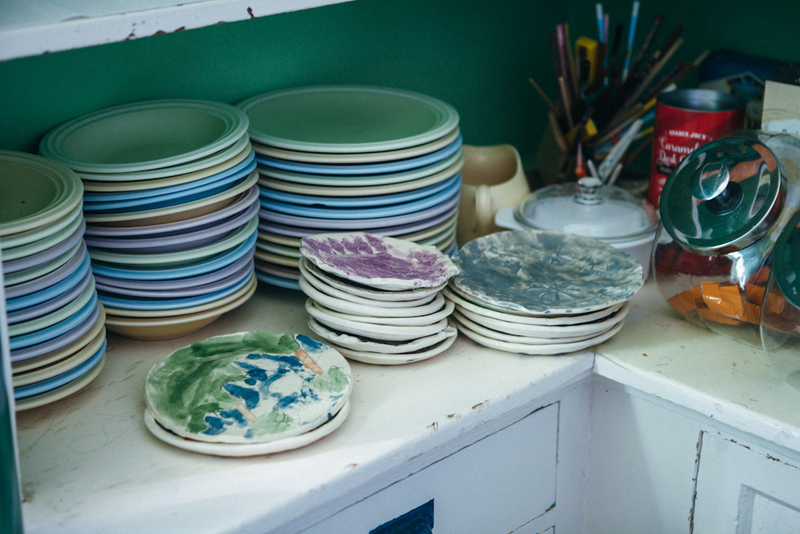 You can take home pieces from Beth’s Camp collection, like an adorable stamped ceramic plate or mini dish. Show some love for our home state and the great outdoors with the Wisconsin Woods plate and Beth’s Yeti platter. There’s plenty more to see, so don’t miss this colorful and engaging exhibition! Note: This giveaway is now closed. And now for the giveaway! Each Under the Wings reader who shares a comment on this post will be entered into a drawing to win set of four fun and unique Beth Eaton Pottery mugs, seen at left! Fine print: No purchase necessary. Must be 18 years old to enter; winner to pick up in store or pay minimum shipping fee. Winner will be drawn on Tuesday, April 1st (no fooling!) and will be notified via email, so be sure to enter your email in the correct field when you make a comment. Museum employees not eligible to win (sigh). Never miss a drawing or a sale–be sure to sign up to receive eNews from Art Museum Store! Donele Pettit-Mieding organizes events, promotions and communications specific to the Milwaukee Art Museum Store and loves to introduce art and design objects for visitors to take home and enjoy in their daily lives. This entry was posted in Behind the Scenes, Museum Store and tagged bay view, beth eaton, giveaway, Milwaukee, pottery. Bookmark the permalink. Can’t wait to see her work when I go to MAM this weekend! Such charming designs! Her plates were my favorite items in the Uncommon Folk exhibit store. 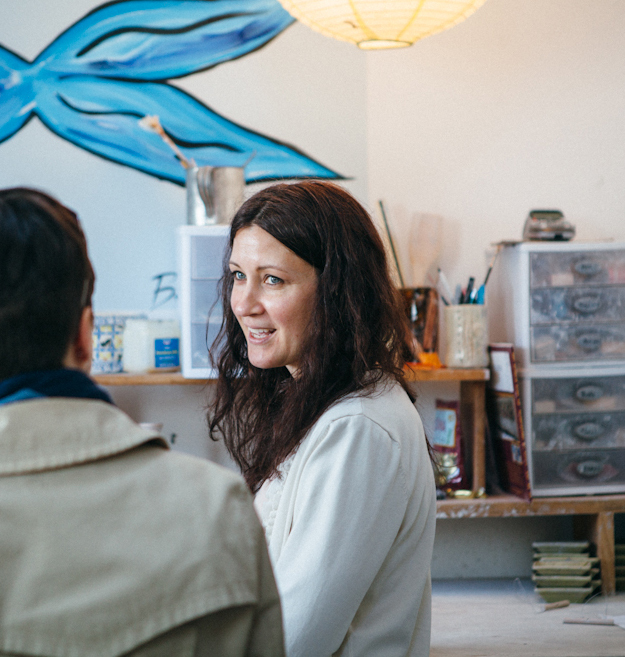 Great to put a face & name on the artist and take a peek into her studio. I LOVE Beth Eaton’s work! I’m happy to be an owner of a few of her wonderful pieces! Thanks for the opportunity to add more to my collection! Beth is the best there is! Great Interview! I love Beth’s work. It is clear she has found the right path. I love her work, especially the Tom Stack pieces. Great story! 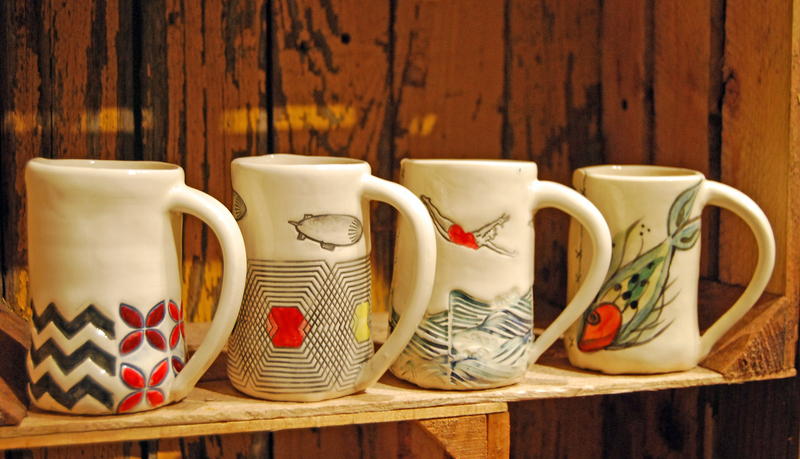 I enjoy my whale/log mug that I got from Beth @ the Fernwood Art Fair last year! Beth is a fantastic artist. Some of my favorite BE pieces are little dipping bowls with her trademark blue fish. Unique and functional art! Love. Love the designs on the mugs. They make me think Spring thoughts! What a terrific article on Wisconsin artist Beth Eaton! Her quote, “…this is endless for me” is such an inspiring and compelling articulation of the artist’s journey. Her work is beautiful, cheeky, original and functional, too! Shared this article on FB and left my name and email for the Beth Eaton drawing. I drink my morning coffee from a lovely Beth Eaton mug each day. I swear it makes the coffee taste a little bit better. Great article recognizing one of Milwaukee’s great artists! We have several fish plates and bowls, and we always receive compliments when we use them! Such beautiful work! I have admired Beth’s work for years. 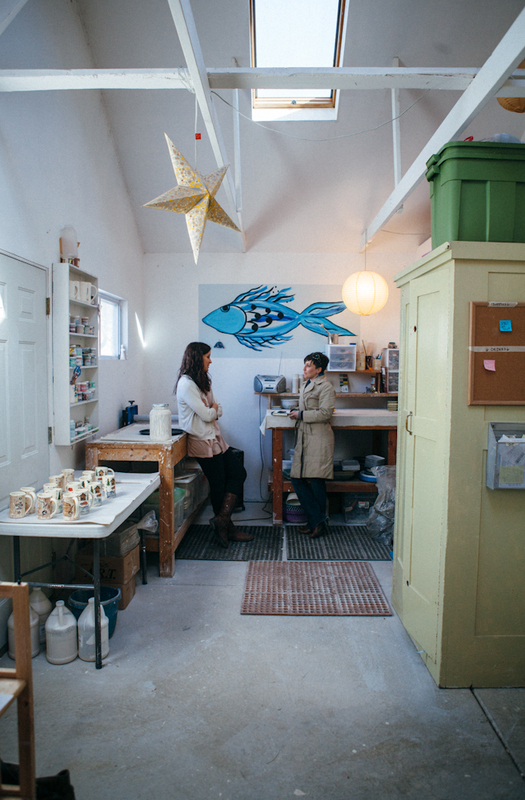 What a delight to visit her studio and learn more about her and her family. I look forward to ordering some custom work from her. Thank you for sharing this beautiful artist with us. I never knew about her before reading this. Her pottery looks awesome! I have to check it out! Love it! How sweet! I love it when stars and moons align and people are doing what they should be! Congrats on a lovely business! .•:*¨¨*:•. ♥ I have a few of Beth’s beautiful creations from years ago, lucky me! Those mugs are AWESOME!♥ .•:*¨¨*:•. So glad to see this wonderful artist get some press! Wow. Fun and Function blend pottery! And you can tell she loves what she does! Her family is sooooooooo fortunate!!! Good luck Beth! What a great article! Thanks for sharing the story of this talented artist. Beth’s work is so expressive. It makes me smile just looking at it. Beth’s plates are amazing . . . they were the first item to catch my eye in the exhibition gift shop. Wonderful work from someone in our home state! Love how she collaborates with local businesses. The camp line is adorable!! I am so looking forward to seeing your work next weekend! Just saw the “Uncommon Folk” exhibit and was delighted to see Beth’s pottery as a modern interpretation of folk/craft art awaiting me at the end. What whimsical beauty she provides! Keep making the world beautiful, Beth! I love your pottery! I have been looking to further my own collection and your art is clever and fun! Fantastic work. Oh I recognized your work immediately!!! I have two little treasures of yours that I bought way back when at the (former, and sadly missed) Paper Boat. Those pieces are two of my most treasured items! Love your imagination and your aesthetic, such a pleasant mix of simplicity with whimsy. 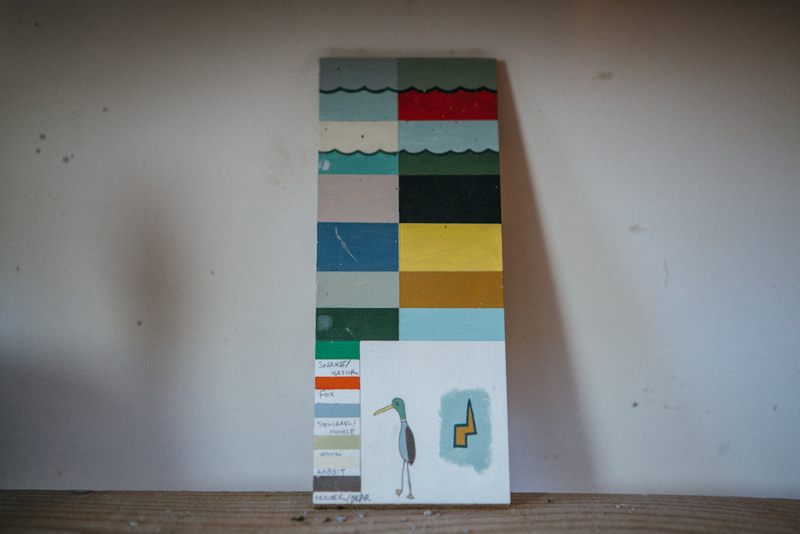 I also enjoyed reading a bit about you, your process, and your studio. Can’t wait to see in person your new work for the MAM! Enjoyed your story. I too fell in love with clay the first time I handled it. You inspire me. I love Beth’s work! I’ve purchased a few pieces over the years for gifts. I’m wondering what kind of clay she uses? Love the white! Also, does she throw any pieces? I must say that this clay work and pottery is really creative, a mini art gallery of sorts. Really appreciate her create pursuits. Thank each and every one of you for your lovely, positive comments. 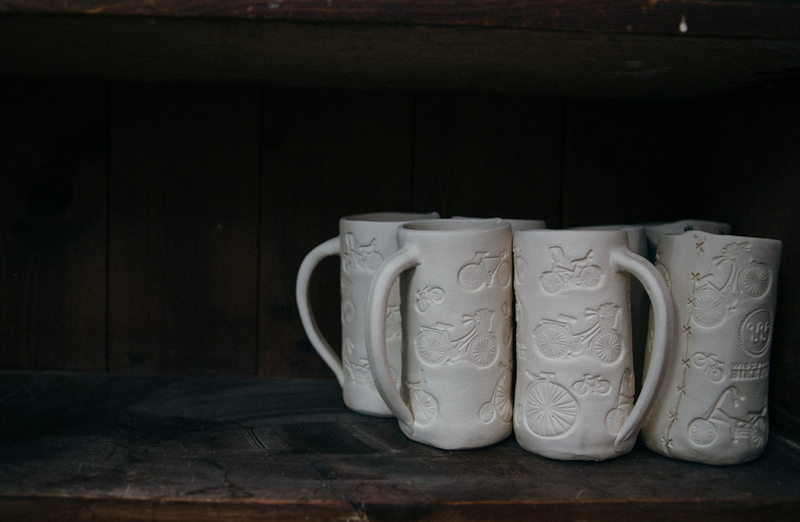 The winner of the drawing for four beautiful hand-built Beth Eaton Pottery mugs is…Jennifer Lucas! Congratulations, Jennifer!